Body Trauma explains what happens to body organs and bones maimed by accident or intent and the small window of opportunity for emergency treatment. Research what happens in a hospital operating room and the personnel who initiate treatment. Use these facts to bring added realism to your stories and novels. About David W. Page (Author) : David W. Page is a published author. 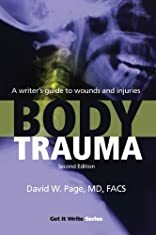 Published credits of David W. Page include Body Trauma: A Writer's Guide to Wounds and Injuries.